Yellowed and thick nails can be bothersome and painful. Uncle Harry's Toenail Relief utilizes powerful essential oils and antiseptic neem to help revitalize and strengthen toenails. 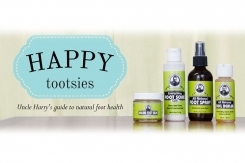 Protect your feet with this healing blend! Essential oils of cinnamon leaf, tea tree, oregano, organic neem oil. Best if used within 36 months of opening. Rub directly onto toenails and into the flesh around and under the toenails for maximum penetration. Continue to apply two or three times a day until the problem area begins to improve. Be persistent! Keep feet exposed to air as often as possible by removing shoes or socks. Product Label Directions: Rub directly onto toenails and into the flesh around and under the toenails for maximum penetration. Continue to apply two or three times a day until the problem area begins to improve. Be persistent! Keep feet exposed to air as often as possible by removing shoes or socks. Product Label Ingredients: Essential oils of cinnamon leaf, tea tree, and oregano, organic neem oil. Warning: Keep out of reach of children. For external use only!